Dental implants are designed to provide cosmetic benefits as well. They replicate the appearance and feel of natural teeth and are frequently fabricated from titanium material. Missing teeth can be uncomfortable, unsightly, and also lead to a number of oral and general health issues. For many years, the only solution for this included bridges and dentures. Today, with advanced dentistry, one of the best ways to replace a missing tooth is with a dental implant. At Access Dental, we use state-of-the-art technology to create natural looking and highly durable implant restorations for our clients. Dental implants are a permanent way to replace a missing tooth with an artificial one. The implant is embedded into the jaw, and the new tooth is then attached to the implant. The implant effectively replaces the missing tooth’s root which helps to prevent jaw bone damage commonly occurring following a tooth loss. Unlike dental bridges and dentures, implants are entirely independent and do not require altering any healthy neighbouring teeth or tissues for support. In fact, they are designed to function just like a real, natural tooth. However, we may sometimes recommend other restoration methods as healthy jaw bone and gum tissue are required for a dental implant to be feasible. Dental implants aid you by preventing your surrounding teeth from shifting into the empty socket left over from your missing tooth (which can cause a number of other complications). They can also help to preserve your jawbone that exists under the missing tooth. 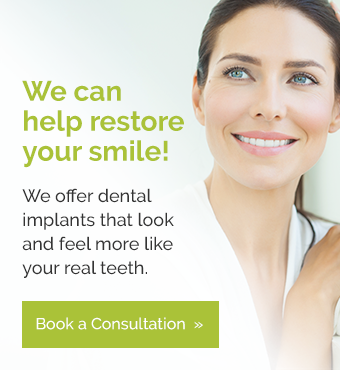 Implants can also improve speech patterns, self-esteem, as well as overall oral health. Since surrounding teeth are not altered to support a dental implant, more teeth are left unaffected which improves their long-term health. Implants are also incredibly durable and can last a lifetime with proper care. They don’t need to be removed when sleeping or eating, making them incredibly convenient to live with. With digital imaging, advanced ceramics, and state-of-the-art equipment, dental implants have become one of the most effective treatments used for gaps and missing teeth. If you’d like to repair your smile today, contact Access Dental to schedule an appointment to learn more about your options.